Like many people (i.e. children) — I eat the thing I do not want before the thing I really want. Broccoli before cookie, sweet potato before pie. I like to save the best food for last. So when I lined up the four flavors of Ben & Jerry’s new Pint Slices, I moved the Chocolate Fudge Brownie to the forefront, so as to get rid of it first. I am not a big fan of chocolate on chocolate. Everything just gets so muddled! I like chocolate to be accented by vanilla — the two just get along so well. I feared that the Chocolate Fudge Brownie Pint Slice would be overkill, for sure. Chocolate is delicious, but too much of a good thing is still too much. Let me just fast forward here and let the cat outta the bag: the Chocolate Fudge Brownie was my favorite of all. [Description: Chocolate Ice Cream Bars with Fudge Brownies, Covered in a Dark Chocolatey Coating.] It was like they sat three people down who were vying for the same job — and they told them to figure out how to each bring their unique skill set to get the job done together. The chocolate shell had the crispiness to offset the smooth, deep chocolate ice cream – and the chewy brownie came in and played the middle man. It was intensely chocolatey without making me sick. In fact, after I took the last bite, I stood up and grabbed another immediately. I couldn’t believe myself. I was hooked. I had extremely high hopes for the Chocolate Chip Cookie Dough, and those hopes were met with a righteous high-five. [Description: Vanilla Ice Cream Bars with Gobs of Chocolate Chip Cookie Dough and Fudge Flakes, Covered in a Dark Chocolatey Coating.] It was fantastic. Proportions were perfect. There were bites in which the only things present were vanilla ice cream with the chocolate shell, and then there were bites in which the cookie dough stepped up, and then there were bites in which chocolate chunks were thrown on top of all of that. And each bite — no matter the participants — was perfect. Suffice to say that I have eaten A LOT of cookie dough ice cream in my life — all of the major commercial brands — and from family-owned shops. Ben & Jerry’s does cookie dough the best. And now you can have it with a spoon — or in your hand. Americone Dream was next. [Description: Vanilla Ice Cream Bars with Caramel Swirls & Fudge Covered Waffle Cone Pieces, Covered in a Dark Chocolatey Coating with Waffle Cone Pieces.] Let’s get real, here. Every now and then, as you are biting through one of these, you may think your eye detects a hint of brown. This is the caramel. This light hint of brown is also all you will ever see of the caramel. You can shut your eyes and try to taste the swirl, but unless you have a detective’s palate, you will not be able to pick up on it. Just let it go, and enjoy the confetti of waffle cone pieces sprinkled throughout — they won’t let you down. My suggestion to Ben & Jerry’s? Either take caramel out of the description or figure out a way to really pipe a little trail of caramel through these things. Because right now — the description on the box is lying. I ended things on what I thought would be a high note: The Peanut Butter Cup slices. [Description: Vanilla Peanut Butter Ice Cream Bars with Peanut Butter Cups, Covered in a Dark Chocolatey Coating.] The Peanut Butter Cup in the pint form is my second favorite ice cream flavor in the Ben & Jerry’s family (right after Cherry Garcia.) I cannot sit down and not eat the whole thing. When they set out to make said flavor, they mastered sweet and salty together. Which is why … if you know and love the original pint variation of this ice cream, I beg you not to buy the pint slice version. It’s good. It’s good! But it is a world away from the flavor we have come to know and love in the pint. For starters — for some reason that I can’t possibly understand – they switched the ice cream from peanut butter to vanilla. Then — they shrunk the peanut butter cups into the tiniest little teensy weensy things. They were so small that they couldn’t provide the correct amount of salt. If you have to encase peanut butter by chocolate and the entire mass sits under a centimeter — there can seriously only be like an eyedropper’s worth of peanut butter in there. That’s not enough when you’re biting into something named “Peanut Butter Cup.” Also — I went through 2/3 of one of these without hitting one little baby peanut butter cup. I did hit a cluster right at the end, but it was a classic case of too little, too late. 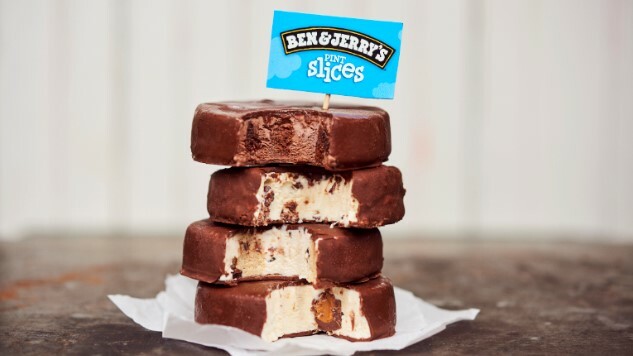 All in all — each of the new Pint Slices was good. Duh! How could they not be good? They are premium ice cream covered in a chocolate shell of optimal thickness and studded with sweet morsels. I’ll forgive all the missteps in this initial round of flavors if they’d just introduce the next pint slice to be that of my heart song: the classic and well-loved Cherry Garcia. Here’s to hoping!